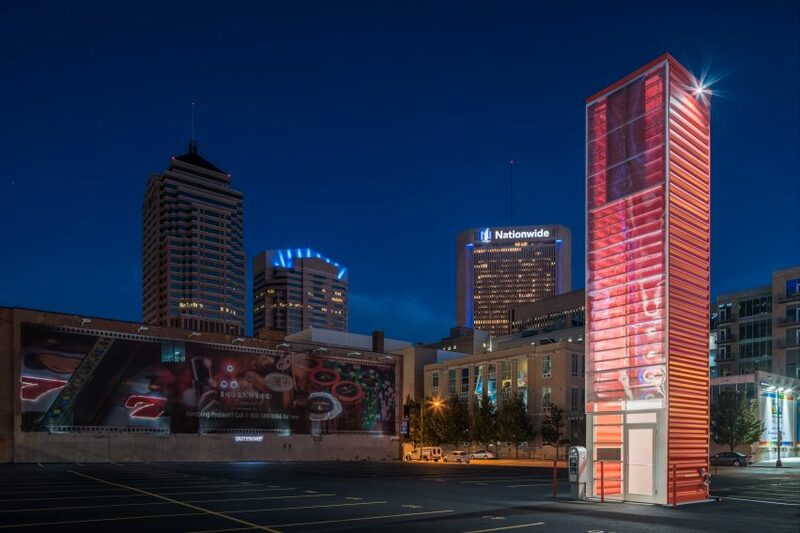 This bright red tower in Columbus, Ohio, is constructed from a shipping containerturned vertically and serves as a booth for a parking attendant. 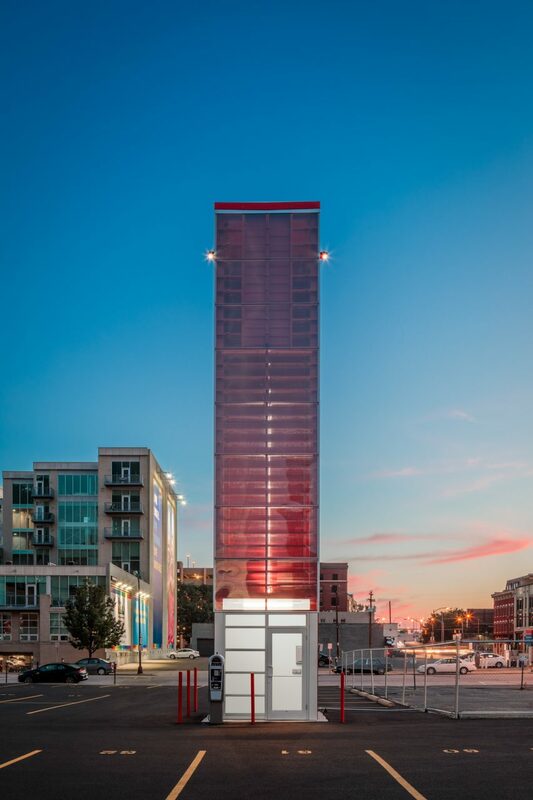 Designed by local firm Jonathan Barnes Architecture and Design (JBAD), the 40-foot-tall (12-metre) tower is intended to act as a landmark for an overlooked part of the city’s downtown area. “This tower presents the parking booth as a new tower on the city’s skyline, realised at a scale both tall and small, its proportions and monolithic nature mimicking the office towers that surround it,” said JBAD in a statement. In addition to providing space for a parking attendant, a portion of the small building’s floor area can be used for other functions. On the south and west facades of the tower, storefront-like openings allow the parking attendant to keep an eye on the lot. This system also allows the tower to close when the lot is not in operation. “On the north, a polycarbonate lift-and-fold garage door acts as both a canopy over the flexible service space when open, and conceals the space when closed,” said the firm, founded by architect Jonathan Barnes in Columbus in 1993. The floor area is eight feet wide by nine feet long (2.5 by 2.75 metres) – the standard dimensions of a shipping container. The industrial crates keep cropping in architecture projects, used for everything from housing, exhibition spaces and teaching facilities to staircases and swimming pools. 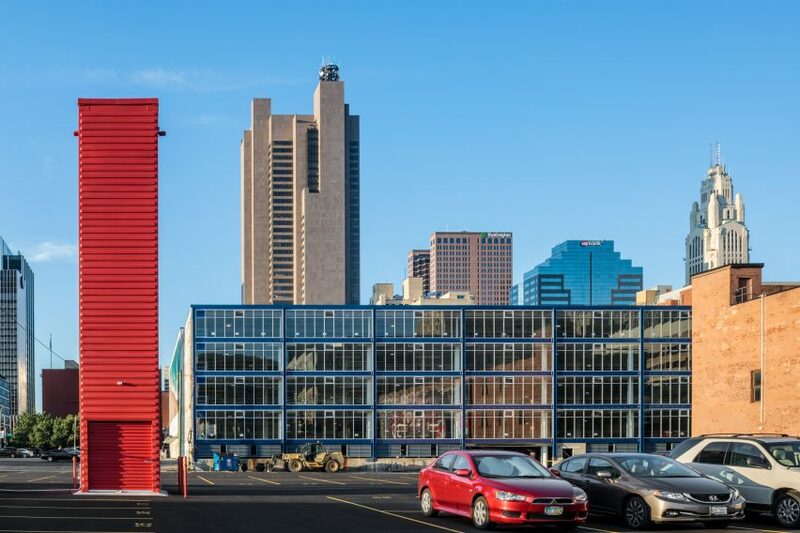 “Inexpensive and readily available, shipping containers (also known as Intermodal Steel Building Units, or ISBU’s) offer an ideal solution to the construction of the MicroTower,” said JBAD’s statement. Using this construction method allowed the team to mostly build the tower offsite, before bringing it to its final location, and adding the storefront and window hardware. Photography is by Brad Feinknopf. On the water by Nikken Sekkei ltd.